Drain Hair Catcher -- a LIFESAVER! Just $6.49 with New Coupon Code! Drain Hair Catcher — a LIFESAVER! Just $6.49 with New Coupon Code! Use coupon code YH66E3H4 for 50% off! 【Quality Material】: Vagafage Drain Protector is made of high quality ABS instead of silicone, which can effectively prevent mold and rust, and can greatly improve your daily life. 【Innovative Design Concept】: Our drain hair catcher design is mainly to separate hair and water, the hair retained in a sealed rubber ring, let water through the cylinder head wall hole, effectively prevent blockage. 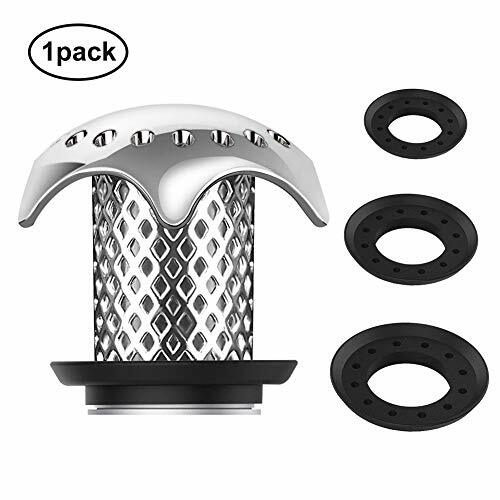 【Wide Compatibility】：Our sink hair drain catcher has four rubber seals of different sizes that match most sewers and support outlet sizes from 1.46 to 1.79 inches. 【Easy to Install and Clean】： You need to select the right size rubber ring to match the drain pipe size, then insert and push into the drain pipe. Gathers and catches hair invisible under drain. You just simply wipe with a tissue. 【Durable & Economic】: Hair catcher has a long life time because it is made of ABS. If the sealed rubber is worn, just replace a new rubber ring for a better experience. If you have any questions about our items, please contact us at any time, we will reply you within 24 hours，we provide 12-month warranty and full money back.